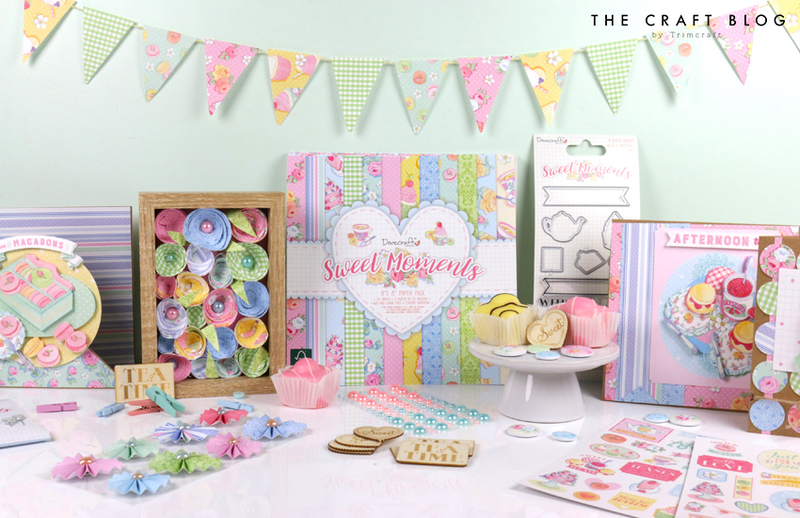 Crafters, we have a super sweet treat for you today in the form of a BRAND NEW collection from Dovecraft. Featuring beautiful papers, a decoupage pad, and lots of wonderful co-ordinating embellishments, we are so excited to introduce you to Sweet Moments. Peer inside the paper pack to find vintage-style illustrations amidst a pretty pastel colour palette. Featuring scrumptious cakes, tea cups, macarons, and country flowers, these paper embody all the elegance of afternoon tea and patisserie. In 12” x 12”, 8” x 8” and 6” x 6”, this pad will be available in all of your favourite sizes! The wonderful embellishments feature elements from the paper pad, as well as other co-ordinating design, so with this collection you’ll have everything you need to create some really beautiful handmade projects. This sticker selection also features some adorable messages such as “Just For You” and “With Love” that you can add to cards or envelopes. Just take a look at this matching stamp and die set – this will really make crafting a doddle! Combine your die and stamp design for the perfect topper for your projects. We really love the banner die that you can add your choice of sentiment too. Can you see the heart-shaped accordion stickers just peeking out of the corner there? They are so adorable – we can’t wait to add these to ALL of our projects. You really can’t go wrong with teapots, teacups, cakes, and scones! The glittered decoupage pad from this collection is full of the most scrumptious-looking treats, perfect for makes for all occasions. We’ve adorned the front of a card with one of the decoupage designs, along with the papers from this collection – such an easy make, but so pretty! If you love adding extra detail to your makes, then Dovecraft collections really are perfect for you! The added embellishments are all you need for adding that extra special touch to your designs. Just take a look at the wooden toppers and buttons – we are already thinking of all the ways that we can use these! Bring your projects to life with this selection of stick pins. The pearlescent-effect finish on these pins is ideal for adding a finishing touch to your projects. What would you use these for? This collection really does have everything you need to create a super sweet handcrafted project. Have you spotted your favourite embellishment? What do you think to this new Dovecraft collection? Launching early April, we can’t wait to see what you create with this selection. How would you use these papers and embellishments? Don’t forget to upload your lovely makes to Inspiration area and to #Trimcraft when uploading to social media! Oh my this is such a sweet and beautiful collection, that´ll be just perfect for all the girly cards over the summer, but also for decorations for all these summerparties for all our little princesses out there. And theses stickpins are so adorable and would look fabulous put through the knot of a giant silky bow on one of these cards or partyinvites maybe, and these sweet stamps and dies will make them most adorable embellisments for those too. Soo beautiful, can´t wait to see it in the stores. ohh how sweet! absolutely love that there is a matching stamp & die combo set, and the sweet little heart pins, as well as the pretty papers! The most beautiful selection of papers and embellishments and gorgeous colours .